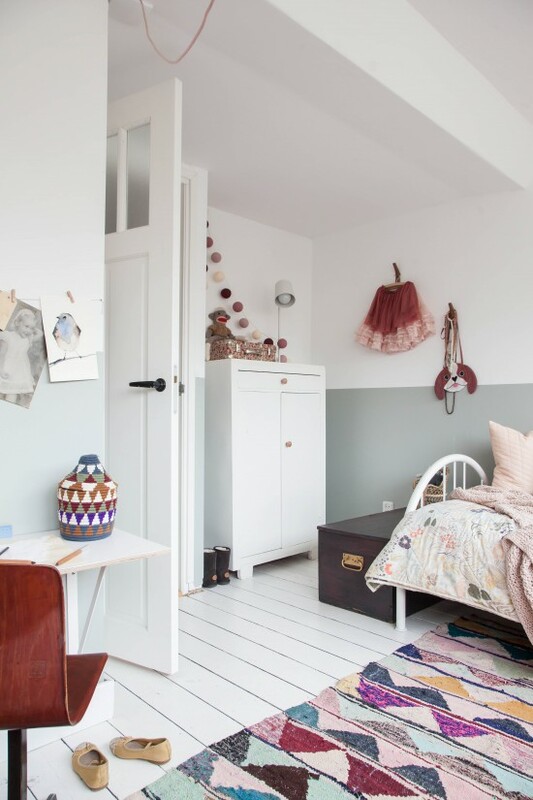 Lola’s Bedroom: Before & After! Hey everyone! I have been dying to share this space with you for, well, about two and a half years in fact. It is a sweet little girl’s bedroom belonging to my daughter, Lola, and it has been in the making for a really long time. I am a little ashamed to admit how long this project has taken me to complete, but in all honesty, with a full schedule of interior design and photography projects on the go, I end up putting my own home and house to-do list on the back burner. Some things just a little time, and thankfully Lola has been a pretty laid back customer and hasn’t minded the delay. During the summer break, I made Lola’s bedroom my focus and I am thrilled to finally, finally share this sweet space with you. You might remember I shared a sneak peek of it a while back (like, two years ago #mybad). Well brace yourselves for an epic before and after, folks. This one was a long time coming, but with this tour I hope I’ve well and truly made up for it! Quick recap: We bought our home 2.5 years ago and have been slowly renovating and decorating it ever since. A lot happened in the first few months, as it always does, and then the pace slowed down while we recuperated after getting married, buying a house and replacing our car all in the same 5 month period. Though we’ve done things in between – painting the staircase/hallway, bringing in new furniture, and doing some exterior work – we seem to have really picked up the pace these last couple of months and are moving quite quickly again. We’ve been working in the kitchen, living room and garden and I will share these spaces with you in the coming few months. 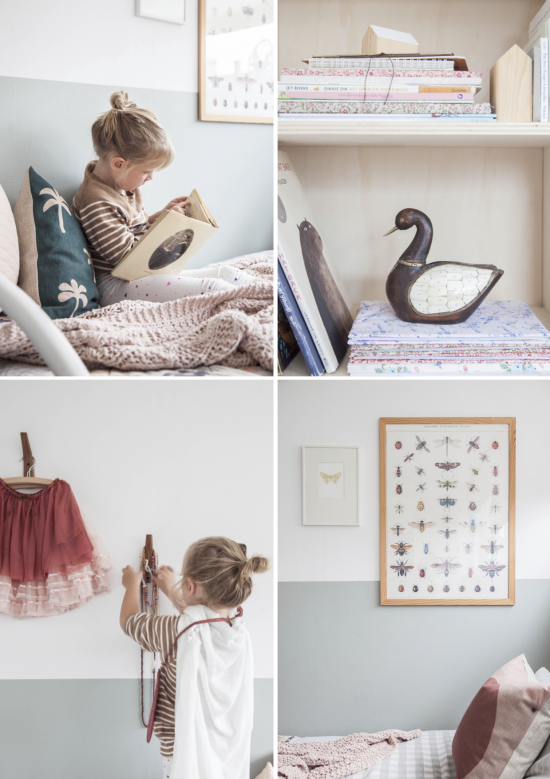 I shared our bedroom last summer, then my studio tour went live a few months ago, I did a studio update more recently and now I am excited we have wrapped up another room and that our sweet Lola loves it every bit as much as we do. A little bit about this room. 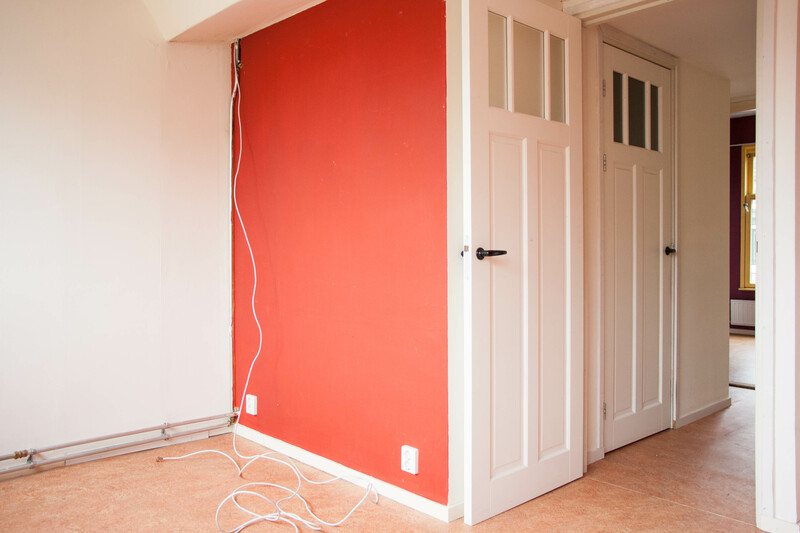 Like our bedroom next door, we had to paint each and every surface, rip up tired old (orange) vinyl from the floors, revealing original wooden floorboards which we then sanded and painted. 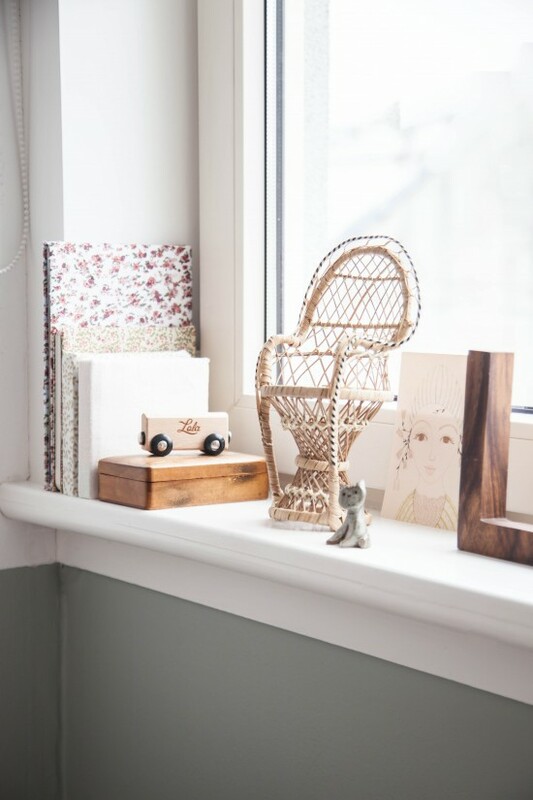 We gave the window frame and sill a lick of paint too, and all the while, we were doing THIS kind of thing in our bedroom next door as well as a ton of painting and sanding downstairs too AND organising a wedding! When I think back to those days, I wonder how we did it. Style wise, I wanted to open this space out and brighten it up, adding bright pops of colour but keeping the space calm at the same time. I wanted it to be fun and playful but not too young so she can grow into it. I wanted lots of texture and comfort so the space really beckons her to not only play but also to relax and unwind. I chose a white basis for the upper walls, floors and ceiling, and painted the lower half of the walls in Farrow & Ball’s ‘Light Blue’. More than two years on, and I am still mad for this colour. 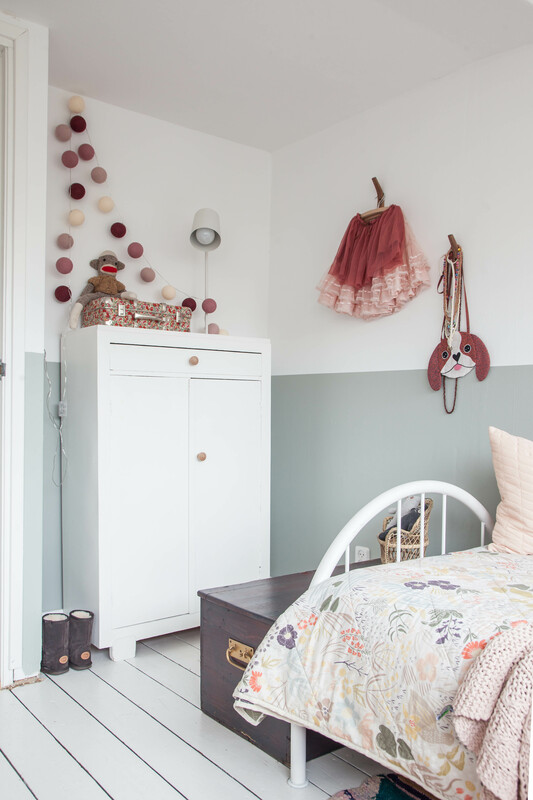 It’s fresh, yet neutral, versatile enough for later on down the road when we might decide to move Lola from this room and make space for another human because isn’t too feminine or masculine. It work’s well with bright colours and beautifully with muted tones. It is a grey/green/blue and that’s exactly what I had hoped for. We bought Lola’s bed second hand for €20 and at the time it was bright red. Cute but not what I was going for. To get the metal frame white, we gave it a light sanding and painted it with radiator paint, using a roller and a sponge to apply it. It was a tedious job but radiator paint dries fast and applies really well. Her bed linen is vintage, I picked it up at a second hand shop for €2,75. They are 100% linen, pale seafoam green and in beautiful vintage condition. Quite possibly my best buy ever. The top has a very thin stripe and the underside is checkered so I fold the top end over so you see both and it makes my heart happy. 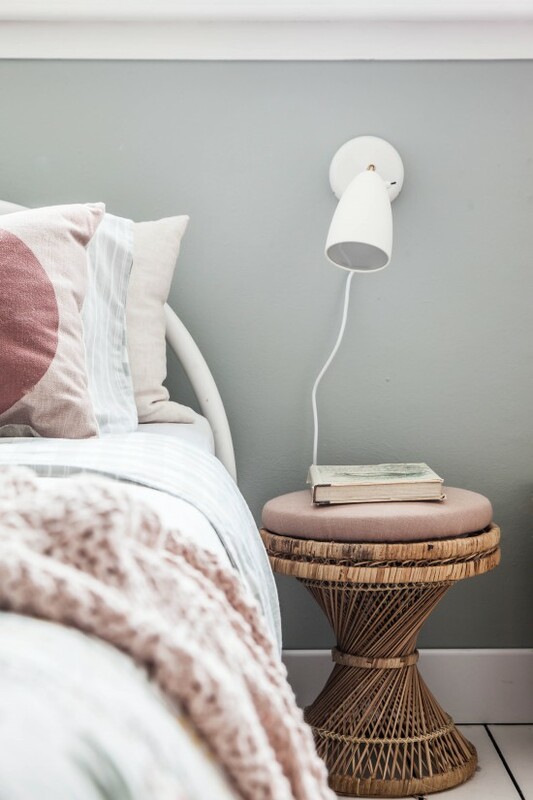 The little stool beside her bed was also a vintage steal. Her pink wool blanket I picked up shopping recently but can’t remember where. 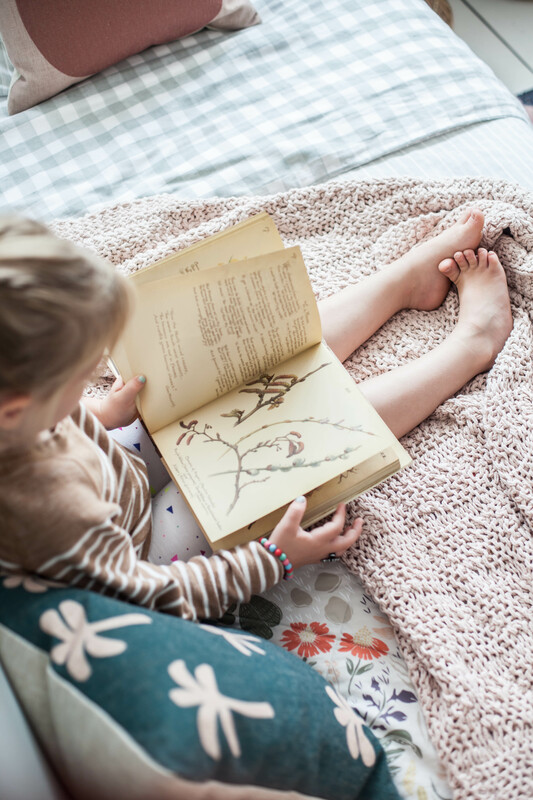 The floral quilt on the end of her bed is the ‘Woodland Meadow‘ quilt from Schoolhouse Electric. 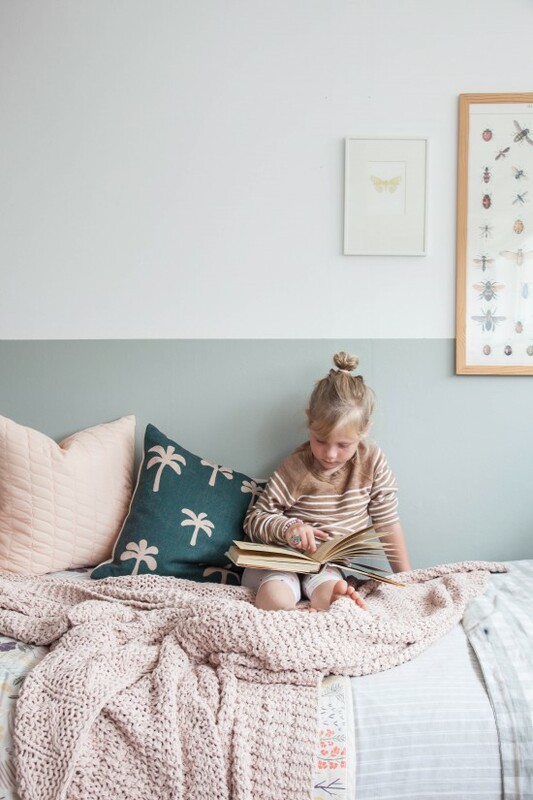 It’s so beautifully made and adds a subtle floral detail to the room that I love in combination with the delicate stripe of her duvet, textured wool of the throw blanket and bold rug on the floor. 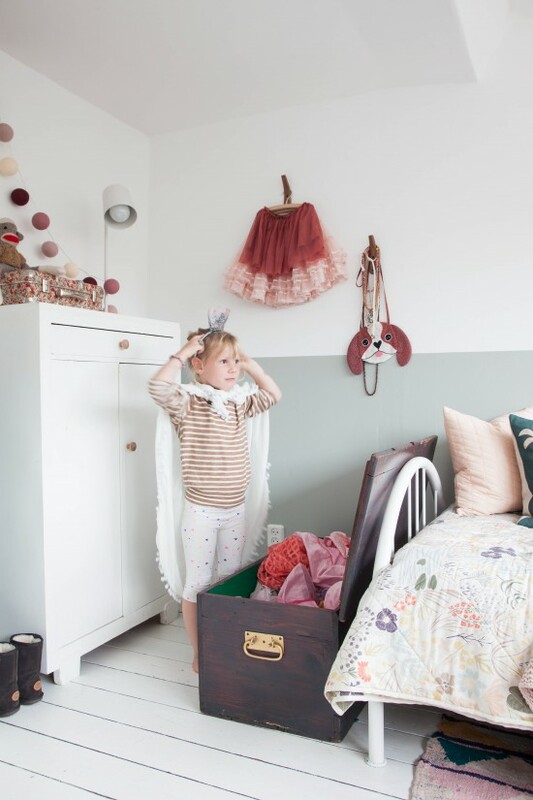 The pillows are by Fest Amsterdam and I love the playfulness they add to her room! The pillow with the big pink dot is actually their ‘Lola’ pillow so it was kind of meant to be. If you love their pillows as much as I do, stay tuned because I’ll be giving away two pillows from their lovely collection next week! Aaahhh look at that photo. Lola is flipping through a book I used to love as a child, called ‘The Country Diary of an Edwardian Lady’, illustrated with beautiful botanicals through the seasons. I was my favourite book and it makes me so happy to see Lola love it too. Would you like to see the BEFORE shot? 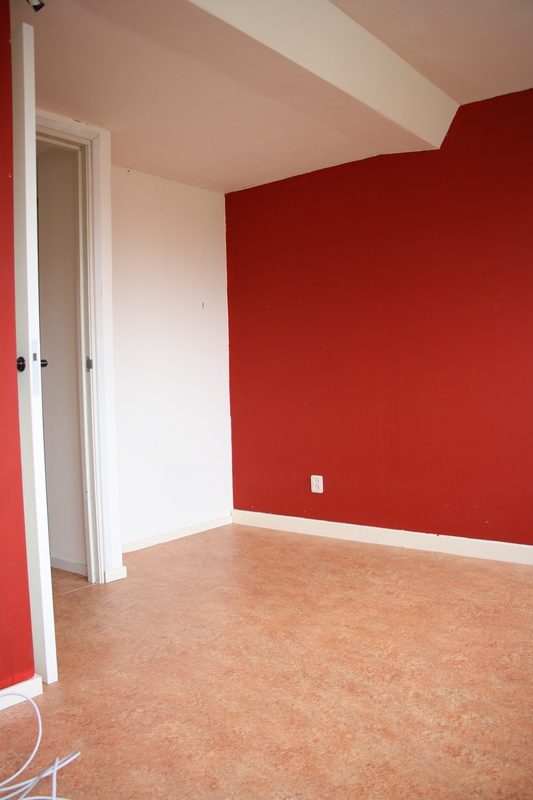 The room was bright red when we bought the house so several layers of white had to be applied to cover over the red. We have amazing friends who helped us paint the whole house all in one day the weekend we moved in. The before & after pics below will attest to the amazing things that can happen when some white paint is applied. The same effect can be seen in our bedroom – big results, little effort and cost effective. The little wooden wall hooks on her wall I found in a little shop on Etsy, called Layer Tree. 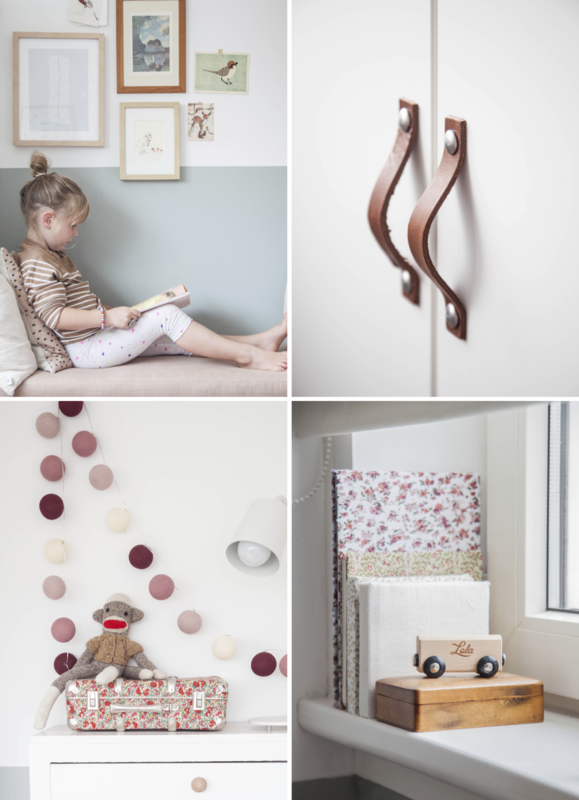 They are a small UK based furniture, lighting and accessories label and have loved these hooks for a while. I used them on a project recently and liked them so much I snapped up a couple for Lola’s room. 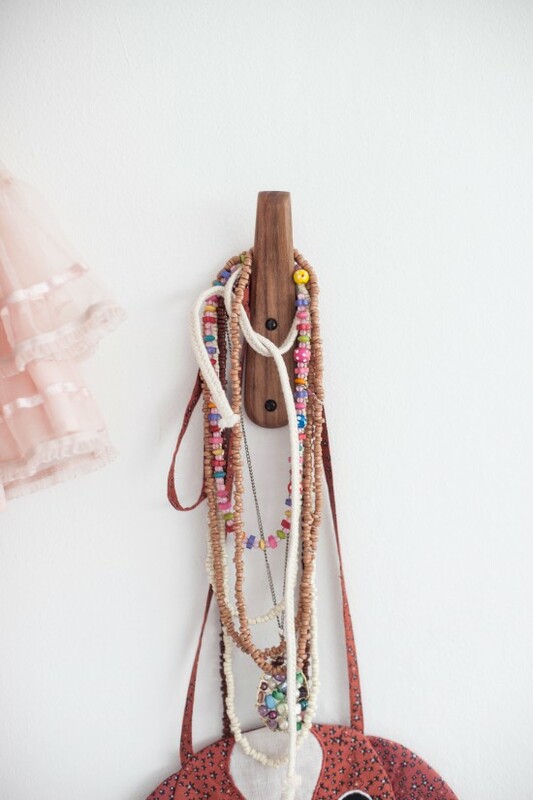 I wanted a place to hang her necklaces and tutu’s and they are understated and perfect.They come in various woods (oak, walnut, ash and elm) and the ones we have are English elm. Cute, aren’t they? So this is the other side of the room – we built her a closet, desk and reading nook all in one using IKEA pieces as well as a little of our own creativity. Below, a quick glance at the BEFORE situation. Not that bad, but certainly not very good. 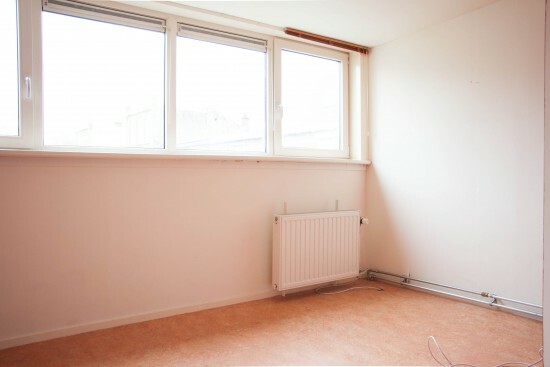 If you look at the first ‘before’ picture you will see that there are two metal heating pipes which are exposed and run down and along the wall, taking up about 10cm of space. This meant that any piece of furniture we placed against that back wall would never have sat flush against the wall. 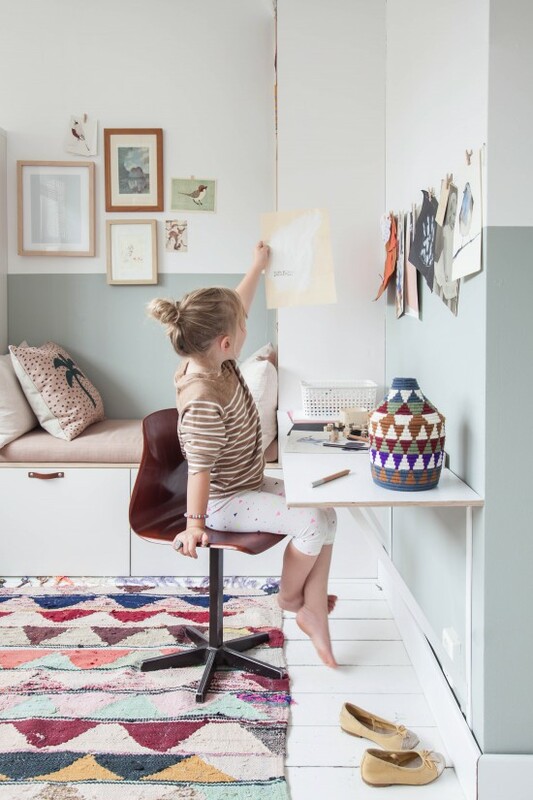 I wanted to create a built-in reading nook that connects to a wardrobe and bookshelf, with a desk area for her to colour/draw/do homework one day/stare at the wall. I wanted it to be inexpensive and one way to achieve that is to use cost effective IKEA pieces as the base as opposed to hiring a carpenter. But because of the exposed pipes we ran into a few problems. And as much as I would have liked to, putting the pipes into the wall wasn’t an affordable option. 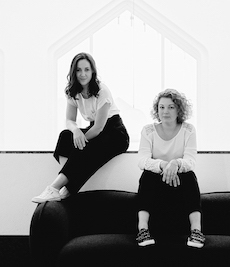 With a bit of mathematics and a lot of time sifting through the IKEA catalogue, we decided to combine two of their popular lines – Besta + Stuva + a little bit of our own carpentry. We then obviously had a 10cm gap between the wall and the middle Besta units, so we placed a sheet of multiplex on top to hide the gap. I have a fabulous upholsterer Shannon Moyer who made a cushion for on top upholstered in an old rose linen blend fabric, which completed the picture. Side note: she is a talented furniture restorer and made these incredible vintage dining chairs which are for sale if you are interested? She painstakingly applied the most beautiful Danish paper-cord woven seat onto each of them and they are stunning. Drop me an email if you want to know more (holly@avenuelifestyle.com). We built a simple desk with large brackets out of multiplex and painted the desk top and side panel of the bookcase white to blend with the Ikea elements, but left the inside of the bookshelf and edges of the desk unpainted for some contrast. 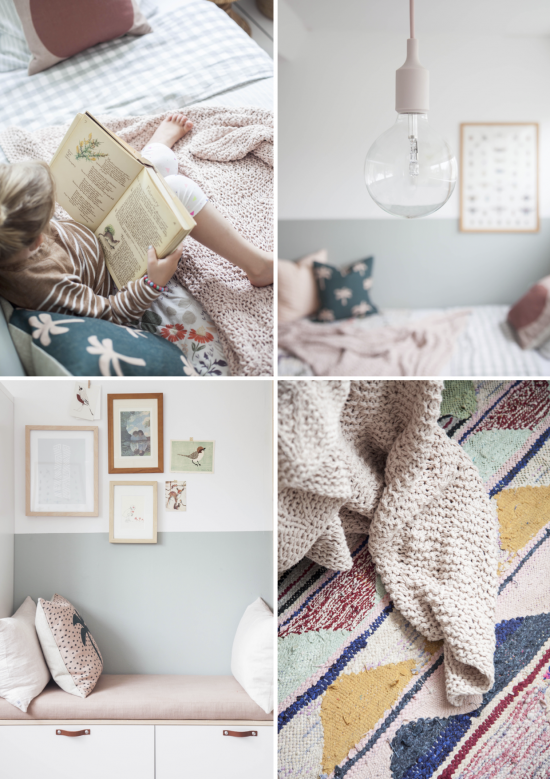 A couple of linen pillows from my favourite By Mölle and a fun pillow from Fest Amsterdam and we are so happy with the results! 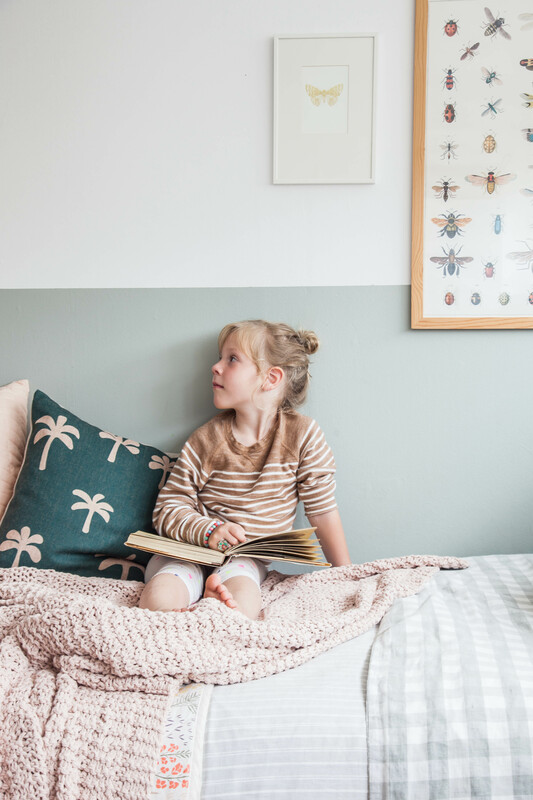 And Lola spends hours here, reading, colouring, playing and relaxing which makes all the time and effort we put into this room more than worth it. A simple length of cotton string above her desk makes a sweet display of artworks and treasured photographs. The black and white photo is my mother as a young girl and Lola looks exactly the same as she did! Lola’s godmother (a talented health coach) painted the little blue watercolour bird. I keep Lola’s bookcase neat and tidy but not filling the compartments full but spacing the books out, adding some decorative objects and even covering some books in pretty fabric. You might think this is a crazy idea, but she has a LOT of Barbie books and primary colours don’t really work in this space. Covering them means they look great in the bookcase and add an element of surprise to story time – you ever know which book it’ll be! Exhibit A above. That is a genuine reaction to discovering the book inside the pretty fabric. I will show you how to do this soon. To finish off the cabinet fronts I used leather handles in chestnut from NU interieur|ontwerp (I use these in pretty much every project, forgive me but they’re cool). You might also know that the door fronts of the Stuva wardrobe from Ikea has a handle cut into it already on one of the doors, so to make it all look uniform, I purchased a second set of doors and used two flat doors and put leather handles on them. The vintage cupboard at the end of the bed is where we store the bulk of Lola’s toys from lego to puzzles and also some of the younger (and less attractive) books that her friends can access easily. The suitcase on top of it is from a shopping trip to Merci Paris when we went to Paris last year and houses doll’s clothes. Mr. Buttons is the monkey soft toy on top of the suitcase who was made by hand entirely out of socks by our good friend Meg Fussell who is a very creative little lady that we admire a lot. Naturally, Lola had to do an outfit change halfway through this shoot. Any diva would. The gallery above the reading nook is a special collection of artworks, vintage postcards and things that I have collected for the last few years. The left most graphic print is by Minted. So that is Lola’s bedroom! I hope you enjoyed the tour every bit as much as I enjoyed designing, decorating and capturing this space for Lola and you. In case you spotted something you like, here’s the resource list below. Back on Monday to share a beautiful book with you guys that is very dear to my heart. Hello holly, really very pleased to see this inspiring room. My daughter of the same age is already asking if she gets the same room. IT gives us envy and energie to build also her room to something similar with our own touch and belongings. Really thank you a lot for your sharing!!! Oh wow! I love it!! Absolutely gorgeous! All of it, but I love the reading nook, am on the lookout for different options for Una’s new bedroom. Lola’s room looks amazing!!! She must love it! Supercool. Very inspiring indeed! Hands are itching now! Look at that! Could I be your daughter in my next life please? I would love a bedroom like Lola’s when I was a child! Is amazing! Congrats! Só cozy! Really, really lovely!! Me encanta la alfombra y todo en general. El baul de los disfraces imprescindible jajaja españa! You did such a amazing work. I haven’t seen such a well curated room for ages. Absolutely beautiful, the colours,textures, all the nice corners created for a little girl. She is so lucky to have such a talented mom! Congrats! Just beautiful. Very serene and feminine without being pink! We’re planning some building work next year and will be giving our daughter and son their own bedrooms for the first time (very sad!) and this could be adapted to either of them. Thank you for sharing! Absolutely lovely room! 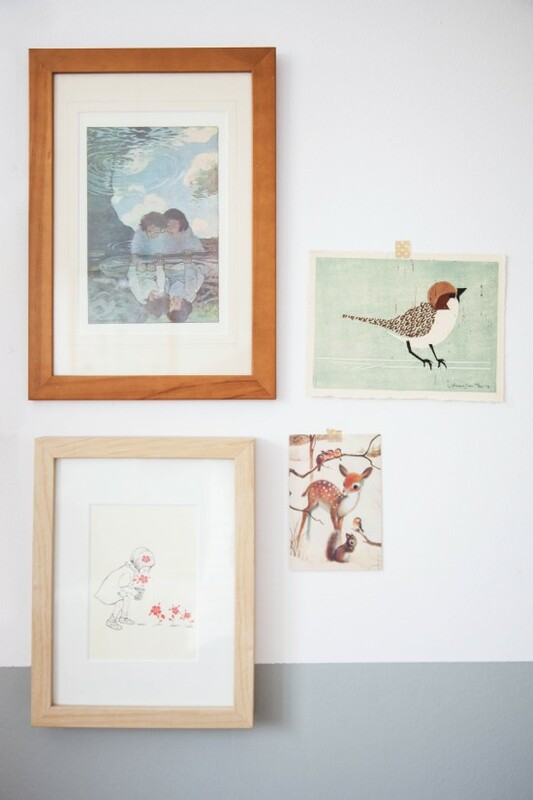 Can I ask if the picture in the light wooden frame with a girl picking red flowers is by the artist Rie Cramer? Love to find this illustration for the room of my own daughter. You did an amazing job! All these wonderful details. I am in awe. You gave me so much inspiration for creating a room for my daughter. Thank you!!! Hi! Super Nice bedroom, cam you explain more Aboutaleb THE extra set of Doors you needed for THE stuva closet? Hi! What an amazing room! Very inspiring! Maybe I missed it in tour blog, but where did you buy the carpet? Thank you for sharing! I was just talking about the perks of having no kids with a friend last night. I’d love to have some but the sleep deprivation is not something I am looking forward to. At the moment I love taking other peoples’ kids for a night or two, but being able to give them back and get real sleep is awePnme.saulioe recently posted..
You are brilliant.thank you so very much,never thought of it. I love your daughters room! Currently planning my little boys room to turn into a little bit bigger little boys room haha. I love the besta + stuva combination. Only thing I cant figure out is how you combined them since the besta is 40cm deep and the stuva 50cm. Would love to hear how you guys fixed that! i’ve got the very same problem and i can’t find a satisfying solution.. have you come across something nice? 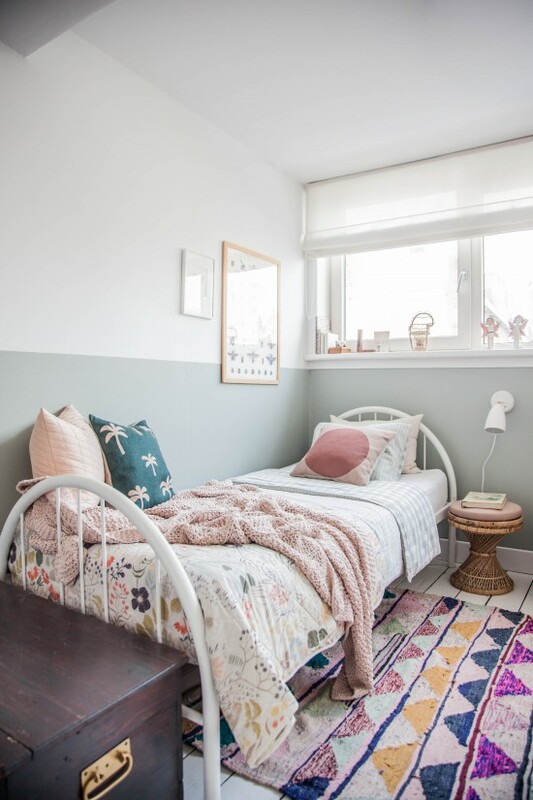 i love the combination of colours and furniture – in short the whole style – in this room and since we are going to move into a new flat, i’d like to have something similar in my daughter’s room. Holly, this is awesome! I love your work! 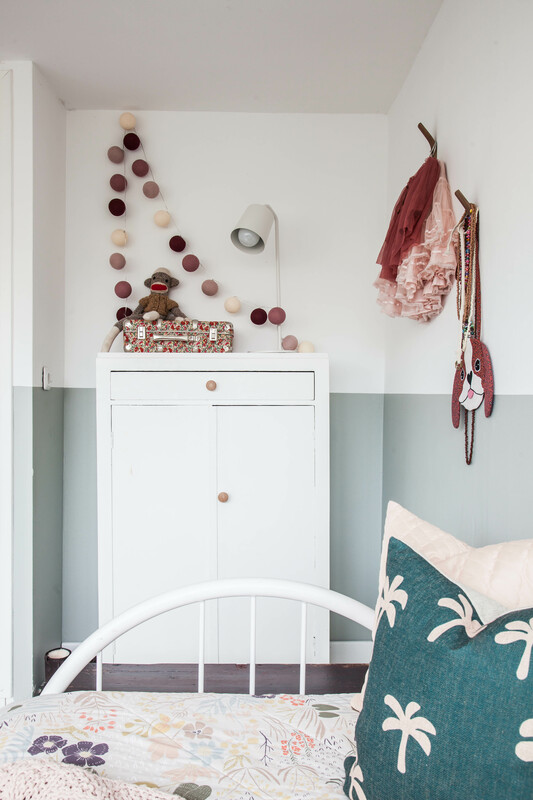 I´m searching for a similar color for the kidsroom, but I would like it to have a pale green touch. 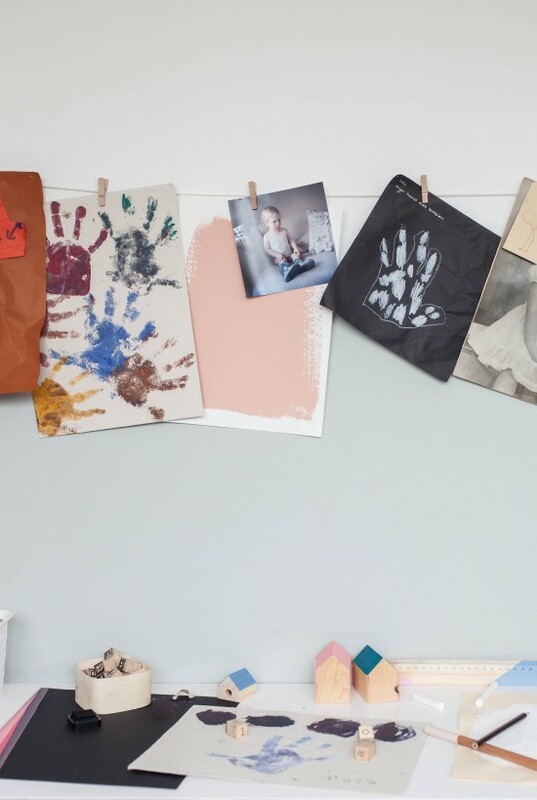 To me the color in Lolas room looks like that but maybe it´s just on the photos? Do you see it as a greenish blue, or a clean blue? I checked the color on F&B´s site and on one picture it seems to turn out green, on the other it´s really blue. So I´m not sure now, if Pale Powder would be better. So hard to choose! I think ordering the samples will be the best solution! But good to hear that the light blue seems to be what i´m looking for! 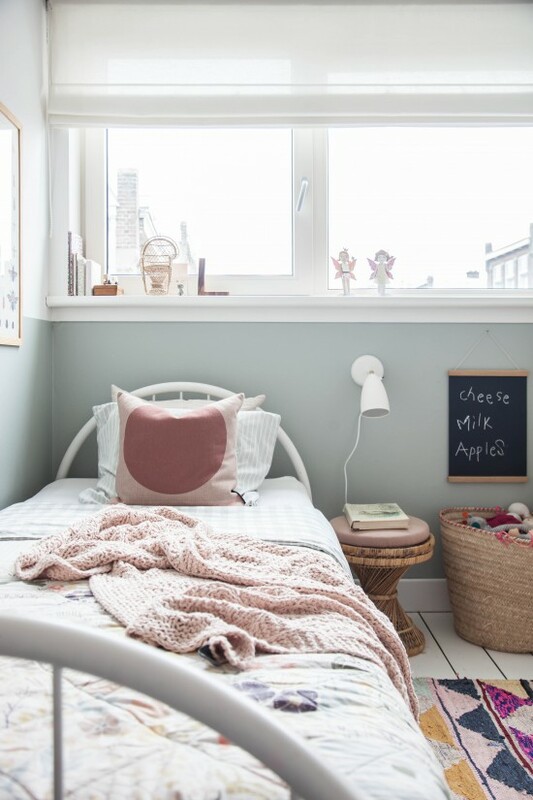 So pleased I found your blog, hope you don’t mind me asking what colour you went for with the Muuto ceiling light, it looks like a very soft pink? but on the website the pink looks very much a baby pink rather than a soft pink. Or is your white/pale grey and it just a trick of the light! 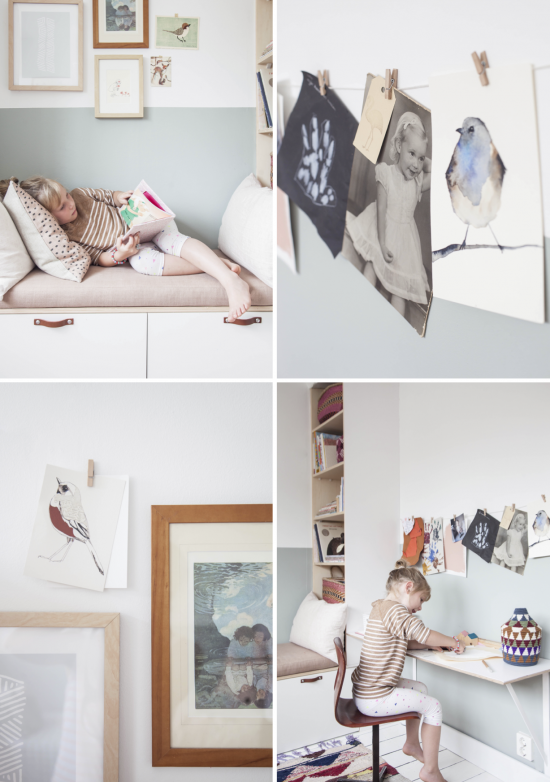 LOVE the half painted wall effect, I will be doing this too. This room is so lovely! Where did you find the bolga baskets on the bookshelf? I love them and haven’t been able to find any with the handles on each side. Thank you! Bravo!! Like it very much!! So functional and nice touch! 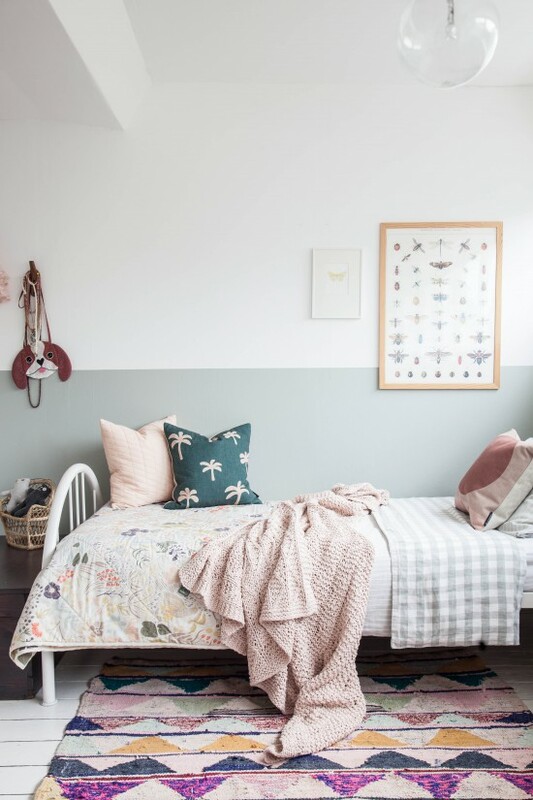 What a lucky child to have a Beautiful, Functional, Living space to grow in…I can’t imagine what it will look like at sweet 16… this is an Awesome bedroom.. love your style..
Hi! Congratulations on such outstanding design!! I was wondering if the BESTA shelf units have doors or drawers?? I can only find them with door and I don’t know how practical that would be to store toys and other children stuff. Hopefully you can give me an insight on that. 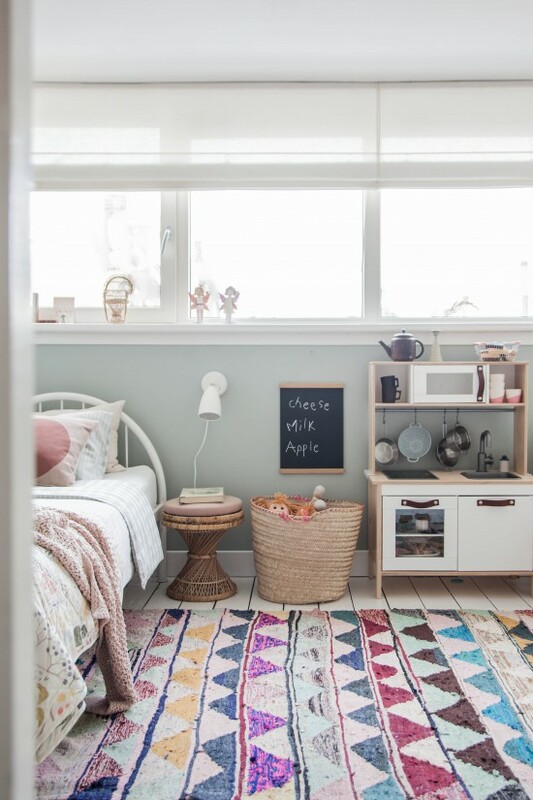 I love this bedroom, my daughters room seems a bit the same, I like it a lot…..
I’m wondering, where did you Find the carpet on the Floor? This is a fantastic room, I can’t stand prescriptive, overly princessy type things,with no though for individuality. Love the colours and texture but also great book choice, absolutely loved Country Diary of an Edwardian Lady when I was small….. Still do…. Wauw! What A beautifull room!! I have been searching for the carpet, but could not find it. Hi, Holly. LOVE your work. Lovely room! 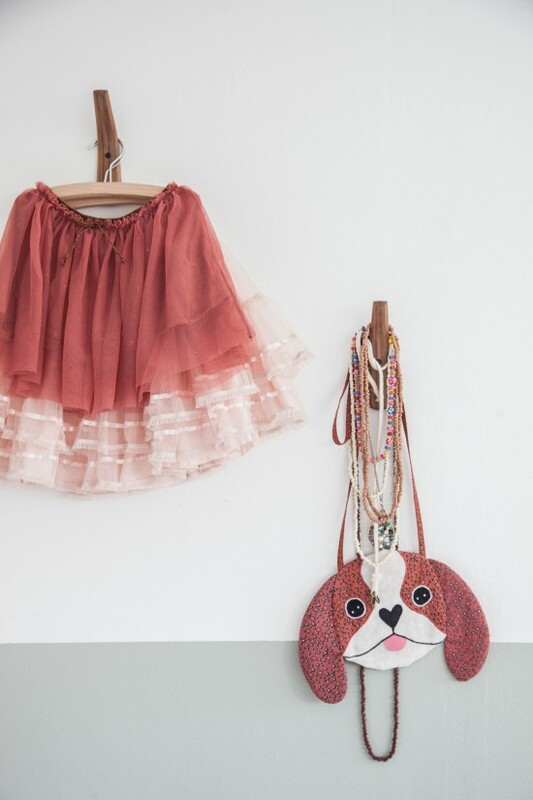 Where did you find the pink baskets in Lola’s bookcase and the one on her desk? Gorgeous! Oh I am so in love with this room.. thank you for the inspiration! and thanks to you I am currently hunting that beautiful book.. it would be lovely to share with our little girl when she gets older! What is de height of the besta cabines of the Reading bench? the room are fantastic. Can you tell me the cm of the stuva and best. I could`t find them. The stuva is 60 x 50 x 128 cm??? And the besta is 60 x 40 x38 ? Is this correct??? 50 and 40 are not the same. How you make it?? The room is beautiful, and the colours are perfect. I wondered where you purchased your Roman Blind or were they made by yourself. It’s just so nice and simple. I love the paint choices here! You said you chose neutral whites for the upper area. I’m just wondering if you chose to paint the trim, ceiling, and walls all the same white? If so, would you mind sharing your paint colour choices? Wow!! I’m ridiculously impressed by this room! Can you tell me the dimensions? I’m moving soon and would to create something similar for my little boy. Hi I am from HK. I love the room A LOT! And I am so glad to know that the wardrobe and reading bench are IKEA which means I can re-create it in HK! But I’m not sure which size of Besta and Stuva to buy? The Besta seems to have 60cm W x 40cm D only while the Stuva measures 60cm W x 50cm D??? thank you so much in advance. THANKS SO MUCH for your reply! You are so lovely! I wish you are based in HK so I can ask you to design my new home! Since the handy-work needs to be performed by me (my husband has ‘twee linke handen’:-)) I was wondering if you could give me insight into how you attached the Stuva to the Besta cabinet and what you used to secure the Stuva to the wall behind it? (I have the same problem with the pipes running along the wall and a 10 cm gap) Thank you in advance for your help! Love love the room! Just one quick question… How did you get the line between the 2 colors so clean? Dis you first paint the whole wall in white and then made the section with papertape? If yes, when did you take of the tape? when green paint is still wet? 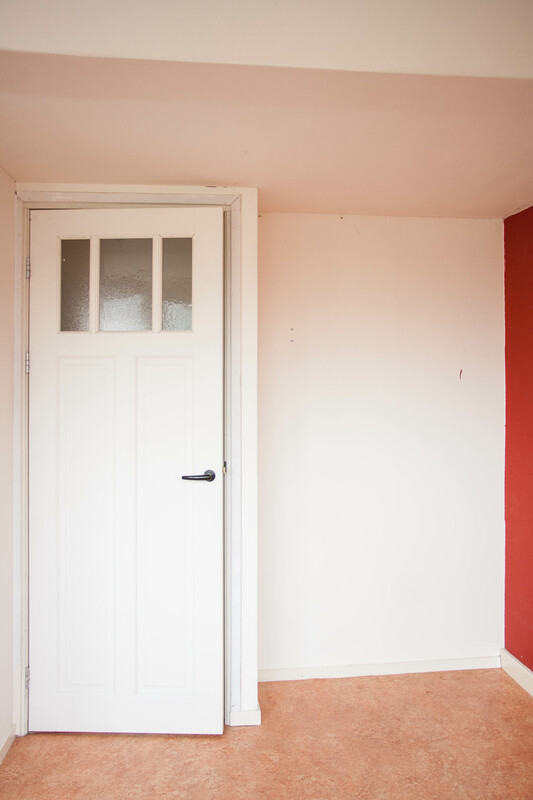 Just another quick question… How much paint did you need for the hole room in ‘Light blue’?